We are so excited to offer a natural nail alternative to nail polish! If you haven't heard of Shellac, it is a wonderful way of keeping your natural nails healthy. Think of it as a hybrid of nail polish and gel nails. It is applied much like normal nail polish, but it is cured under a UV light to set it hard. This means a hard wearing two weeks of fabulous colour that doesn't chip or smudge. You don't have to wait for the colour to dry so you leave the salon with battle-ready nails!! 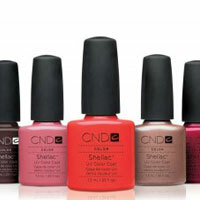 To book your Shellac manicure or pedicure, please contact the salon on (07) 3397 5153.